In this article, I want to write about a little-known danger when using investments to support one’s retirement. Very often, I hear of clients using stocks and REITs as a source of income to support their retirement years. I do not have any problem with that except that they underestimate the risk of using such instruments. At the end of this article, I will show you that a portfolio of stocks/REITs is worst off compared to the CPF Ordinary and Special Accounts. To calculate how much you need for retirement, you have to make some assumptions on the kind of returns you can get from your investments. Let’s say you are confident to get 5.25% (5.246% to be exact) per annum of returns. This return can be in the form of dividends or capital gain or combination of both. It does not really matter actually. The second assumption is how many years you will live. Let’s assume 30 years. This is where the problem lies. The calculation assumes a risk-free portfolio. In the real world, there is no risk-free 5.25%. 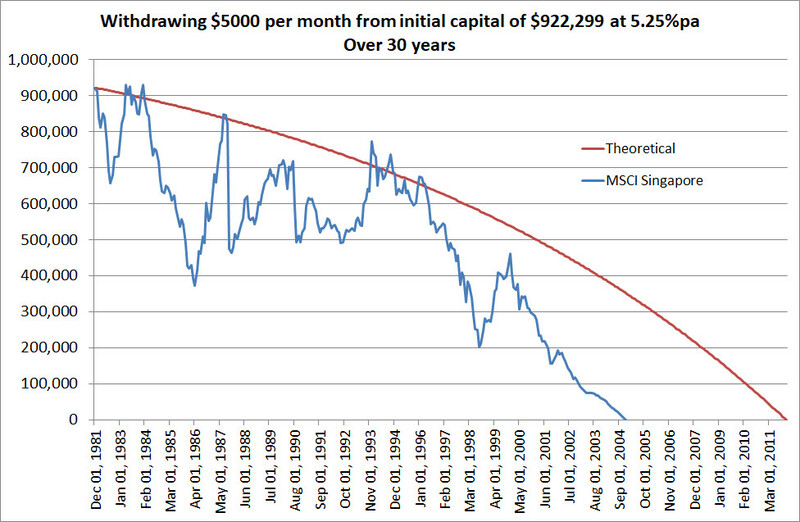 If you would to ‘invest’ in the MSCI Singapore and withdraw $5000 per month, you end up running out of money 23 years later as shown below! This is entirely not acceptable as it happened at the tail end of one’s golden years. You can’t expect the senior citizen to start selling tissue paper at such an old age! So what happened? The reason why you end up running out of money much earlier than expectation is because of the volatility of the portfolio despite having an annualized return of 5.25%. Due to volatility, you end up selling your portfolio at a lost during the market downturn. The portfolio has to be much larger than the theoretical $922,299. You need to have other source of passive income like rental income, CPF Life etc so that you do not unnecessarily sell your portfolio during market downturn. But for discussion sake, let’s assume you do not have any other source of passive income, exactly what is the portfolio size required? 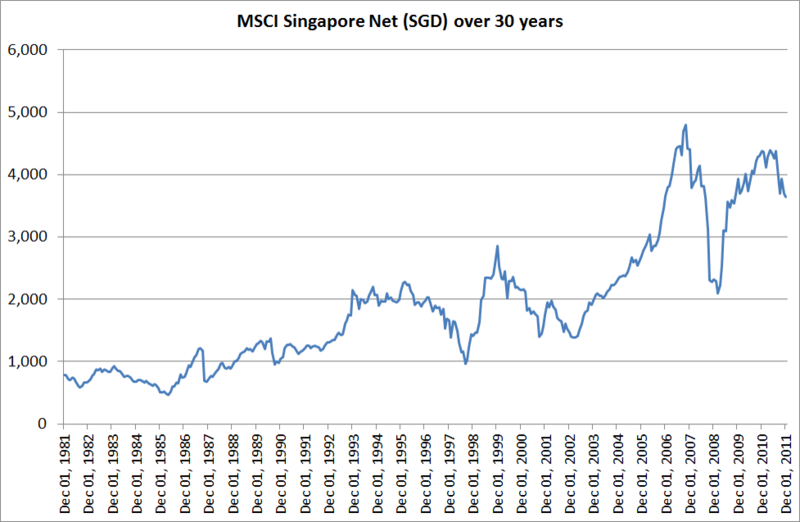 Geometric mean: 5.25%, Standard deviation: 23.945% (which is the volatility of MSCI Singapore), Withdrawal amount per month = 5000, inflation =0% and 30 years withdrawal period. 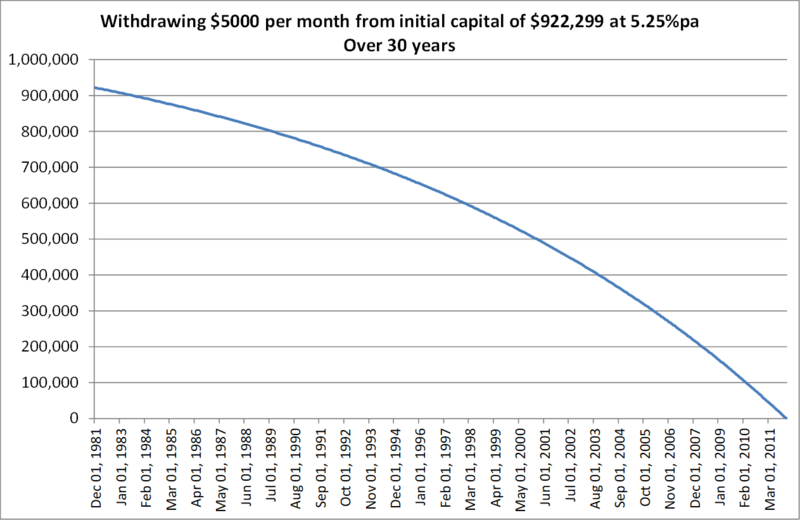 The simulator shows that at 90% probability of not running out of money before 30 years, the total portfolio size required at the beginning is a whopping $2,198,289! Note that there is still a 10% chance that you will run out of money! This is madness!! Why is the portfolio size so large? The portfolio size is a function of both the expected returns and volatility. As volatility increases, the portfolio size required shoots up to the roof. For those who are observant will notice that 5000 * 12 months * 30 years = $1.8 million which is below the initial portfolio size of $2,198,289. So this means you will be better of just putting your money under the pillow. Many uses REITs to provide a dividend income for their retirement. The FTSE ST All Share Real Estate REITs index has a volatility of 11.5% based on weekly returns for the past 3 years. So using the exact parameters in the Monte Carlo simulation except reducing the standard deviation to 11.5%, you need $1,365,037 in order to have 90% chance of not running out of money. This figure is now more reasonable. But wait, there is something wrong. What is the discount rate assuming no volatility? This figure is lousy. CPF-OA/SA/RA has interests that are far above this figure. So this means you are better off putting the money in CPF-OA/SA/RA with 0% volatility and 0% failure rate. No need to rebalance portfolio, attend AGM, participate in rights and all those nonsense! Before anyone throw rocks at me, I am aware that CPF is not exactly ‘risk-free’ as it is subject to policy risk (e.g. goal post may change as had happened in the past). But you do not need to put all your entire kitchen in CPF. The cash on hand – the money outside of CPF - can be used to purchase private retirement products which can give a guaranteed return far higher than 1.95%. Some even can match CPF-OA’s return. If you want to plan for retirement, please consider signing up for my retirement planning package which I will use a combination of various products (e.g. bonds, unit trusts, annuities and CPF ) to construct a suitable retirement portfolio to generate a diversified sources of passive income. As Bill Bernstein noted, the worst time to retire is just before a major crash / recession. And the best time is in the aftermath of one (provided your retirement assets have survived the crash!). However for most people, putting their entire funds into equities during retirement is too unrealistic & risky. Even a plain vanilla approach calls for 60:40 or 70:30 bonds-to-equities ETFs, with annual re-balancing and annual drawdown of no more than initial 4% portfolio amount from the bonds portion. I think what those clients meant is being able to accumulate and/or grow an equities portfolio large enough such that the dividends & distributions alone are at least 50% or 100% higher than expenses for their required lifestyle. There are people already with such portfolio sizes and some of them are not that old, maybe early-40s to late-40s. Portfolio size would be in the region of $2+ to $3+ million. People with such retirement funding approach will still need to be savvy & actively manage their portfolio, especially if containing individual stocks / REITs. The risk is whether they can maintain their cognitive abilities & savviness as they go into their 80s and 90s?? Not everyone is a Buffet or a Munger. Another good article, Wilfred. You mentioned that some private retirement products can give a guaranteed returns that even match CPF-OA’s return. From the way it is phrased, I would assume that such products are rare and few. In that case, I may as well max out my CPF voluntary contribution to the CPF annual limit of $37,740 ? If we can do that from the start of our working years, I am sure our combined savings in CPF OA/SA would far exceed the FRS at age 55. After setting side the FRS, we can withdraw the interest earned in our OA/SA to fund our basic needs after 55. Dividends from stocks/REITS could fund our “wants”. Hope to hear your comments on the above.